Wall Lava Lamp for Sensory Environments, schools, Snoezelen Rooms and other children's and adult environments. 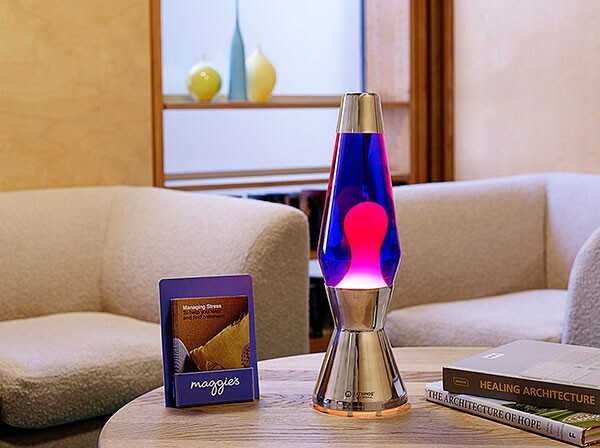 A unique lava lamp for walls in sensory and wellbeing settings. Brilliant in multiples in sensory and stress reliving environments. Neo wall is elegantly designed and made from solid cast and polished metal metal with fresh white accents. It can be mounted at child or adult viewing heights. It comes complete with fixing plate and cable grip to make it both easy to mount and safe in situ, see movie tab below. It is low voltage and is not too hot powered by a long lasting 20w halogen capsule bulb. It is fixed together as one unit and has shatter-proof glass making it suitable for use in a busy environment such as schools, sensory rooms or areas for relaxation. 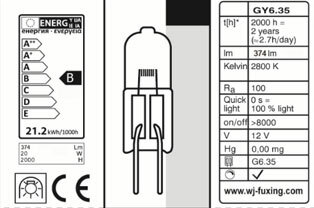 Replacement bulbs and bottles are available and are easy to change with the use of the Allen key, provided. NB. The lead can also exit straight out of the back of the product rather than hanging down the wall allowing it to be hiden from view if chased into an internal wall. Please note the lead must exit the base of the wall to allow the transformer to be pluged into a socket. Consult your electrian. Working closely with Mathmos, lighting designer Jonathan Coles and his team have developed a unique wall mounted lamp. Designed to be easy to mount and service and top quality to last as long as possible. It has a number of features that make it simple to put up. The lead simply hangs down the wall and plugs into a standard socket, it can be tidied up by the optional cable grip. See video above. Wall fixings vary depending on the composition of your wall. The lead may also be hidden and chased into the wall. Please consult an electrician. 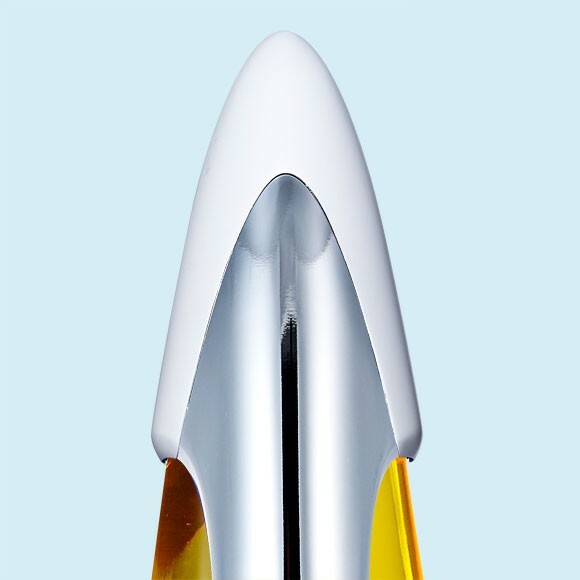 The bottle is made in Britain and filled by hand in our factory in Dorset with our unique formula. Over 50 years of experience and expertise ensures that our lava flows better, is clearer and lasts longer. The lamp does not need to be taken off the wall to change the bulb or bottle. Simply use the Allen key provided to undo one screw then lift out the bottle and access the halogen capsule. 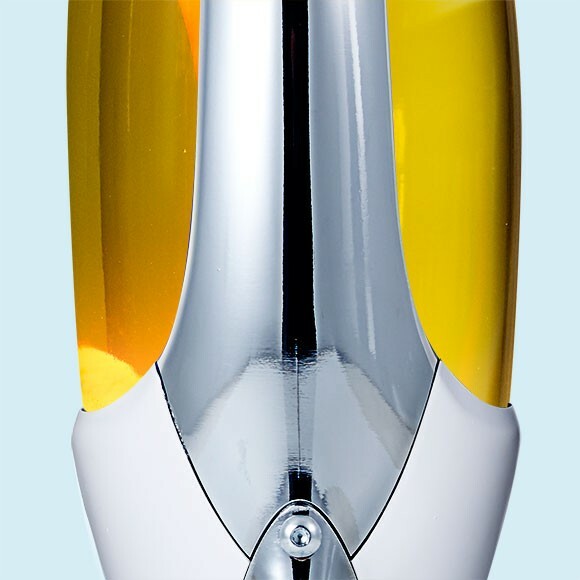 Replacement parts including capsule bulbs and bottles are easily available here. 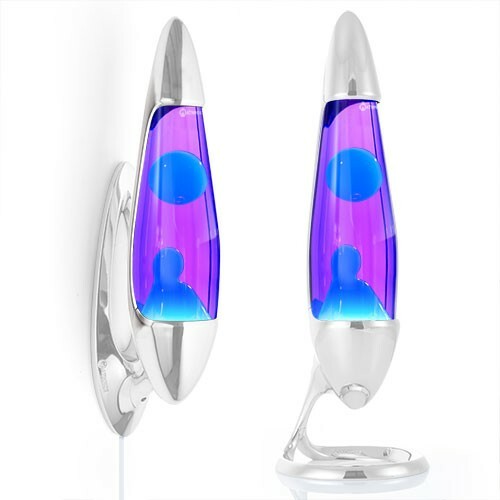 Neo lava lamps are a great addition to any multi-sensory environment. They can be used to encourage relaxation and reduce aggressive behavior. Also to focus attention, increasing concentration and promoting intellectual activity. Constantly moving lava shapes provide a point of focus for eye-tracking work to improve visual development. Helpful working with Autism or Brain Trauma. Neo is a great tool for promoting calming relaxation . Choose blues, greens and violets to calm the mood. Good for working with those with Insomnia, Epilepsy, ADHD and Autism. 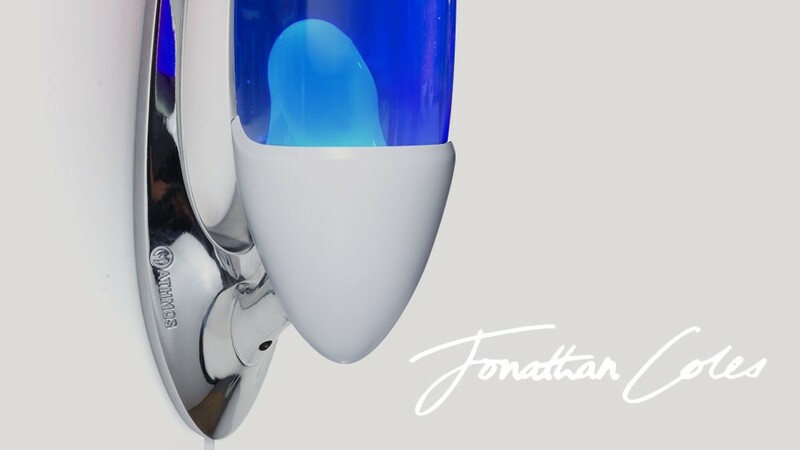 Neo produces a soft gentle glow perfect for gently waking up, or as a safe night light. Its soft light does not hurt the eyes of those with photosensitivity to light or these suffering from Autism with hyper-sensitivity to light. It is also useful for working with Dementia, Brain Trauma, Chronic Pain, Epilepsy and Insomnia. Colorful lava lamps with ever-changing shapes can help stimulate the visual sensory system activating different perception areas to support overall development for those that are neurologically impaired. Helpful for working with Autism, Brain Trauma, Downs Syndrome, Dementia and Light Sensitivity. Neo helps people focus on the movement of the lava as opposed to physical pain and discomfort from medical conditions or painful physiotherapy. The lava also acts as a distraction for those with a variety of mental health issues. Neo Wall carries all the appropriate safety tests. Like its sister Neo it is suitable for environments for both children and adults. It is low voltage and powered by a 20w long lasting halogen capsule bulb, included. 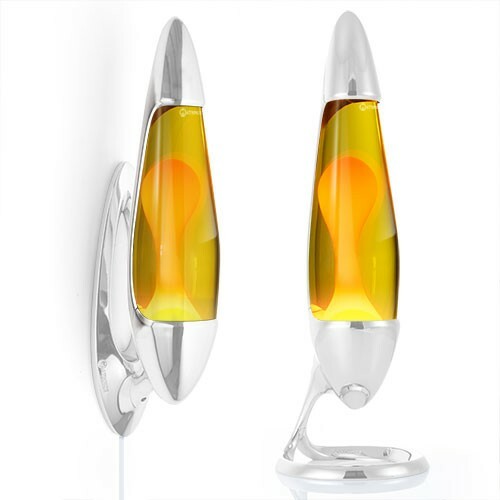 The built in reflector ensures that heat and light are directed towards the lava and away from the metal making it run cooler. White metalwork runs cooler than polished metal, in combination with the 20w capsule bulb and reflector Neo wall is cooler to the touch. The lamp is not only fixed to the wall, but the bottle is also attached to the base. This means than when assembled no part of the product can fall and the the bulb cannot be touched. We are a Gold Star Trusted Merchant on review site Feefo. If for any reason you are not happy with your purchase we have a simple returns procedure. Spare parts including bottles and bulbs are available here. Changing the bottle and bulb when they end their lives is very simple. All orders from Sensory Lights are delivered swiftly and free, see here for delivery information. We offer many ways to pay for your products, see here. 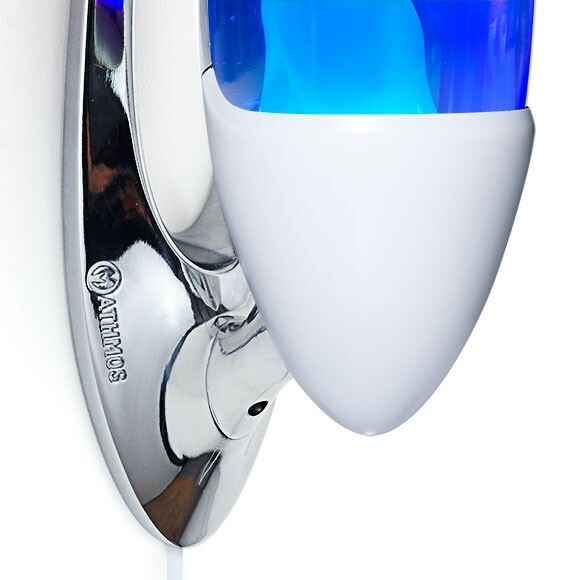 When you buy from Sensory Lights you are buying product sent directly from our Dorset factory. Direct contact with the people who made the product and can best support you. Choose a position on a suitable clean, flat surfaced wall, which can provide suitable mounting. Do not place near sources of heat or cold, such as a heater or air conditioner. The product operates best in a room temperature between 68° F/20° C and 75° F/24° C.
For best performance, we recommend you keep the product away from: sunlight to prevent fading, drafts and cold place to prevent slow operation and freezing, hot places to prevent overheating. Place the wall mounting plate on a suitable flat surfaced wall. Make sure that the plate can be placed flat against the wall before mounting. Ensure the plate is vertically mounted. Ensure the cable is fed correctly through the wall cover as shown. Slot the base & wall cover assembly on to the wall mounting plate by hooking the lugs in to the three keyholes. Check the assembly is hooked on to the wall mounting plate, then secure to the plate by pressing in and turning the screw in the stem of the product using the larger M4 Allen key provided. Ensure the screw is tightened enough so that the assembly cannot be lifted off the wall plate. 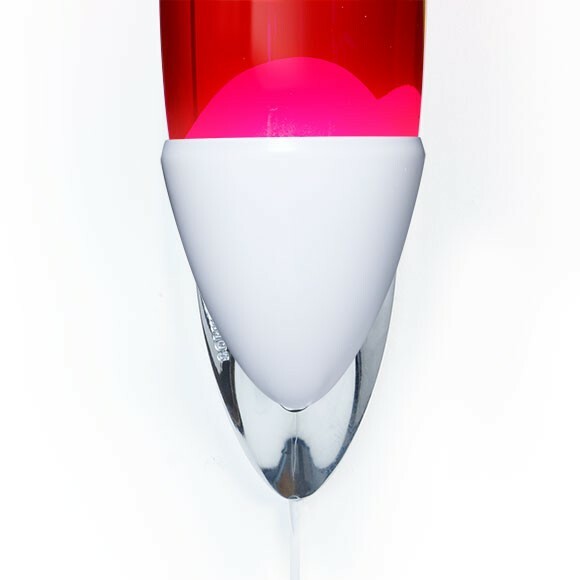 Once secure, place the long arm piece on top of the bottle and firmly push in place. Align the Mathmos logo to be facing forward. Carefully place the bottle with the arm piece into the lower cup and line up with the screw hole in the rear of the lower cup. Insert the screw provided and tighten with the smaller M2.5 Allen key provided. 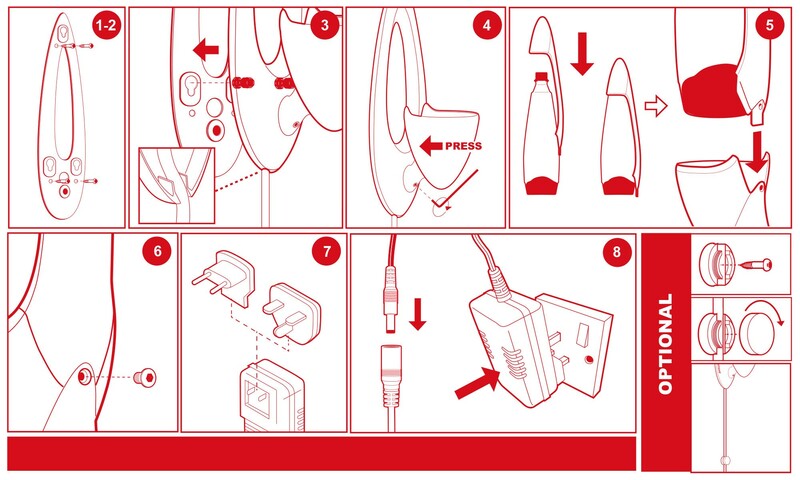 Slide the correct plug inset (EU or UK) on to the switching power adapter until it clicks. Plug the switching adaptor provided in to the cable DC socket. Plug the product in and turn it on. Between 1-3 hours depending on the surrounding temperature. Stalagmite shapes may form during the warm up process, these will then melt and the lava will begin to flow. It is normal for the glass to have small air bubbles and moulding scars. Please do not leave the product on for more than six hours a day or allow it to overheat; this will prolong the life of the product. 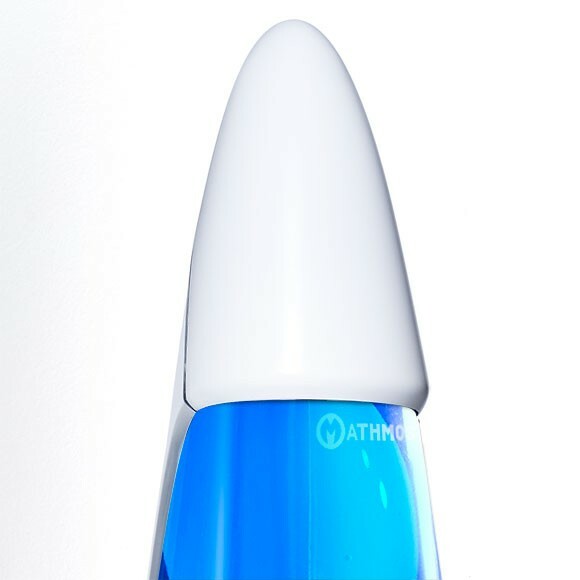 Overheating will shorten the life of the product; if it is overheating there will be either only one large bubble at the top of bottle or a lot of very small bubbles. Never move or shake the lamp when it is in use or still warm, as this causes irreparable clouding. When your product has ended its like it will begin to go cloudy, the colours may fade and it will not move as well as it once did. This will happen after approximately 2000 hours in operation. 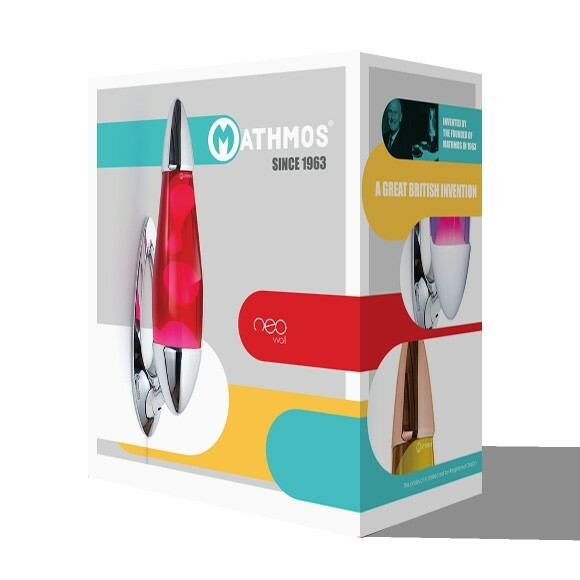 Whether your product has ended its life or when you wish to have an alternative colour combination, visit our website at www.mathmos.com for more information on a replacement bottle or full product. Please note we do not refill bottles. Please on no account open the secure cap and add liquids. IMPORTANT! Always allow the product to cool down completely prior to handling. Do not attempt to move the product until fully cooled. Once your product has completely cooled, use the Allen key provided to unscrew and remove the back screw out (keep these components safe). Carefully, holding the bottle and arm piece, lift and remove the bottle and arm piece from the base. Carefully take the arm piece off the bottle and place it onto the bottle you would like to use. Now refer to ‘set up’ for instructions on how to assemble. The product is supplied with a switching adaptor (Input 100-240v ~ 50/60 Hz, Output 12V 2.5A). This product’s external flexible cable cannot be replaced. If the cable is damaged in anyway the product should be destroyed. This product carries the statutory guarantee of the country of purchase and meets all the applicable standards requirements. Use this product only for its intended use as described in these instructions. Do not use attachments not recommended by the manufacturer. Do not leave this product unattended when not assembled. Do not lean or push down on the product once it is mounted on the wall. 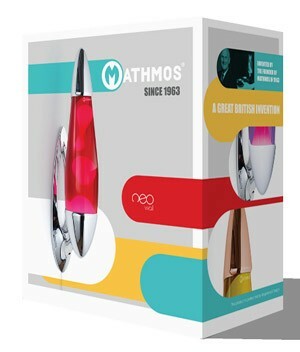 The liquids in the product are not dangerous and can be disposed of normally (for details see our online FAQ’s at www.mathmos.com). If the liquid is swallowed by mistake, drink plenty of water. If any symptoms appear, please visit a doctor. Never use this product if the bottle has been dropped as this will create weakness; obtain a replacement bottle from Mathmos and dispose of the old one in a safe and environmentally friendly manner. If the contents of the bottle are spilt, please dispose of as much liquid and lava as you can remove, then use recommended cleaning methods for removing the coloured water and wax on whatever surfaces you have. Never touch the bulb if the product is switched on or if it has just been switched off to avoid burning. 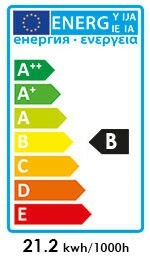 To replace a defective bulb, unplug the product and let it cool down sufficiently. “Thank you to Mathmos for supporting Maggie’s. The ambience of our centres is crucial in welcoming and inspiring visitors who are living with a cancer diagnosis. We rely completely on the support of creative companies such as Mathmos to ensure we can bring the right support to people living with cancer across the UK now.” - Marie McQuade of Maggie’s Centres.